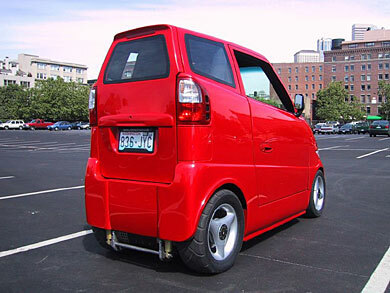 I thought the Smart Car was tiny, wait until you see the Tango! This father and son invention, from right here in my own home state of Washington is spectacular! The Inventors are Rick Woodbury, who is a self-taught engineer and printer who once raced and sold Porsches and takes his inspiration from Tibetan Buddhism, and his son, Bryan Woodbury, a 24-year-old computer whiz and physics junkie. 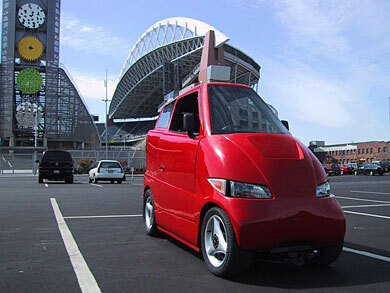 The end result is a styling little electronic car that goes 0-60 in four seconds and a single charge can take you about 80 miles. The Tango will be sold in a kit form and they will be offering a few production models slated for release in early 2005. You can preorder your very own Tango today starting at $18,700.